Sharing Narbonne High’s campus, principals Gregory Fisher and Gerald Kobata. At the final panel of the “Promising Practices” forum held all day Saturday, participants called for an arbiter at the district level who could step in to help solve disputes at schools sharing campuses. The panel discussion was titled “Leading the Way with Collaboration and Sharing of Promising Practices: Perspectives from the Field” and included three sets of principals at co-located sites that share the same buildings, gyms and libraries. Sometimes the relationships are strained at first, as in the case of when Narbonne High School found its staff and students separating into a pilot school. 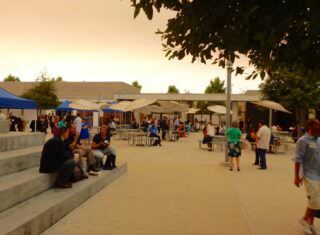 A smoky morning at the Sonia Sotomayor campus because of the Sand fire in the Santa Clarita Valley. Now co-located for their third year, the principals agree things are going smoothly based on the mutual respect they have for each other and their regular communication. “We had to get our staff to see that this is good for the students and we’re not competing with the other school,” Kobata said. Both Narbonne schools shared professional development training such as active shooter training and a seminar on economics. Narbonne’s schools have common state championship sports teams, which is part of the glue that holds the school together, but they still have problems that the district could step in to help. Yvette King-Berg of the Youth Policy Institute. “The students are fine, they don’t see a difference,” Kobata said. Fisher suggested that district administrators help settle disputes rather than simply letting the principals haggle it out. “Emotions can take over, and that needs to be addressed in a way to show there’s nothing personal,” Fisher said. Yvette King-Berg, executive director of the Youth Policy Institute that runs the Monseñor Oscar Romero Charter Middle School on the campus of Berendo Middle School, warned that charter programs shouldn’t use Prop. 39 to co-locate at a district school and then come in with a bad attitude. King-Berg said she often has coffee every week with the Berendo principal, and they collaborate on grant proposals for both schools and share best practices. “The community and parents all come together in the Pico-Union area and we treat them all like they are all our students,” said Berendo Assistant Principal Justin Howard. The Sonia Sotomayor Learning Academies, where the conference was taking place, is a complex of 1,900 students with four high schools and one middle school, and two of the principals discussed their co-location issues. 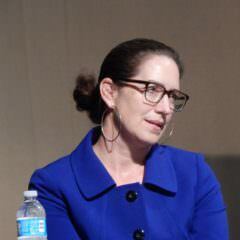 Principal Kristine Puich of the Los Angeles River School. Despite the mix of independent charter and traditional pilot school programs at the Sotomayor campus, the schools coordinate Advanced Placement and college testings, share costs for the librarian and athletic director and open after-school events to everyone. But sometimes they are at odds and “some things need to be hammered out that are beyond a conversation between principals,” Puich said. Nunez added that “over the past five years we have had some very, very heated discussions and some of them got very ugly because that’s how passionate they are.” She was also asking for someone from the district to help them come up with solutions when conflicts arise. Superintendent Michelle King said she and her staff are gathering suggestions and solutions offered during the nearly three dozen sessions held Saturday. Although more than 350 people signed up for the event, about 200 turned out. Some didn’t show because of the fires in the northern part of Los Angeles, said a district spokeswoman. King and school board members Monica Ratliff and Ref Rodriguez attended, and board President Steve Zimmer gave a rousing speech before he had to leave for a family issue. The seminars were equally mixed with charter and LA Unified district officials as well as parents and experts in this first-ever forum of sharing best practices. 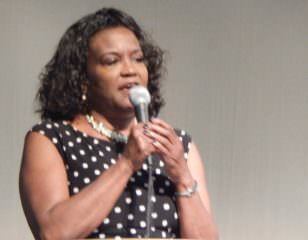 Michelle King closing the “Promising Practices” forum. Representatives from the teachers union, UTLA, and administrators union, AALA, attended the free seminars as did representatives from Partnership for Los Angeles Schools, the California Community Foundation and many other groups. 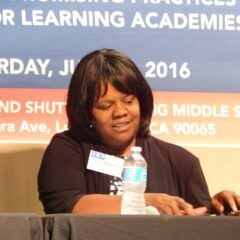 Also in attendance was Marcia S. Reed, principal of 186th Street Elementary School in Gardena, who was just selected as California’s 2016 National Distinguished Principal. King said she hopes to double the numbers of the sessions and hold a similar collaboration next spring.